This is definitely my favourite Iron Maiden album and one of my favourite albums in general, and there are exactly eight reasons for it. But it would be boring to list them, because the tracklist can be found above the reviews. I've tried hard to find an oh so slight weakness, and failed miserably. Well, not miserably, as I don't want to find one, but you get what I mean. 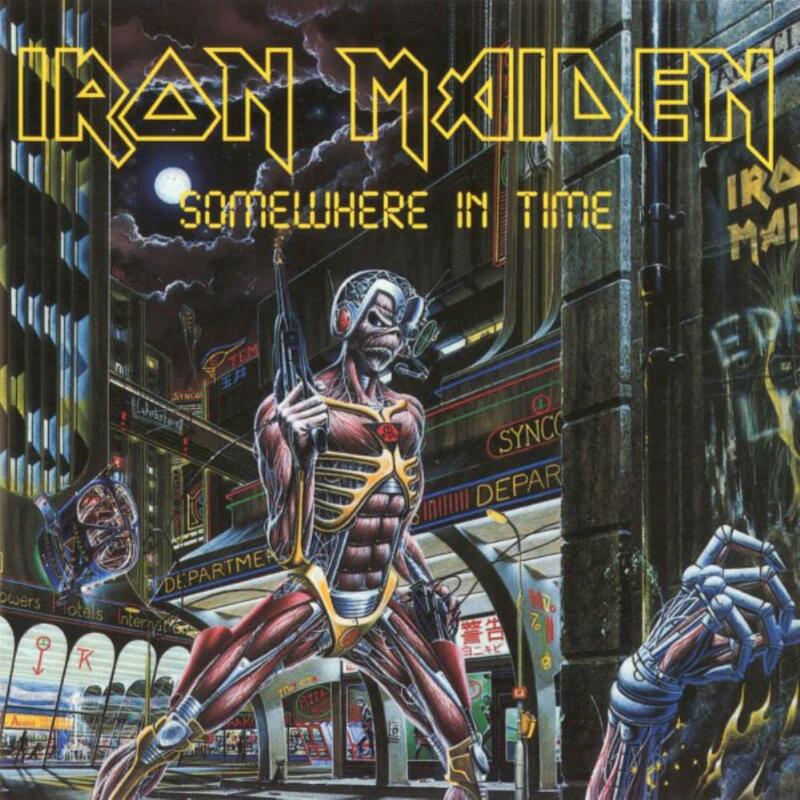 Somewhere In Time is a powerful album from the first to the last chord, the perfection of the famous Iron Maiden sound, and manages the near impossible: it is even stronger than its already great predecessor Powerslave. It doesn't matter whether a song is fast or a bit slower, Steve Harris' bass guitar saunters through it, supported by the ever precise drumming of Nicko McBrain. Dave Murray and Adrian Smith perform twin guitars at its best, Wishbone Ash never reached that level. Above all flies Bruce Dickinson's voice, fed by lyrics that really suit him. As I said, every single one of the eight songs is simply great and worth 5 stars. Though, this is not completely true, because there is one song that is even better and worth 6 stars. Which one? The one where all those wonderful things I mentioned about the musicians are featured strongest: the most galopping bass beat, the twinniest twin guitars and the deepest, possibly darkest lyrics. In short, Stranger In A Strange Land. The song's only weakness (ha, I've found one in the end!) is that it is only 5 minutes and 43 seconds. 10 minutes would do it more justice. 5.17 stars for the whole album. As this site limits ratings to 5 stars, I'll go with those.